However, the band’s latest release and eighth studio album, Graffiti on the Train (co-produced by Jones with Jim Lowe and released on the band’s own label), is the highly anticipated follow-up to the virtually ignored and easily forgettable 2009 release, Keep Calm and Carry On. Mere seconds into the moody opening track “We Share the Same Sun,” it becomes glaringly obvious the band has regrouped and rediscovered their passion for making records. The pre-released singles “In a Moment” and “Indian Summer” in conjunction with their accompanying videos (conceived and directed by Jones), acknowledge Graffiti on the Train as Stereophonics’ most revealing and honest work. The affecting and tragic title track (“The train sped down the line/It was the last train he would ever ride”), and the raw emotion of the bluesy “Been Caught Cheating” (“Now I love you like the way I’m meant to do”), immediately let you know Kelly Jones has gotten his mojo back on track. Intensified with string arrangements by Bond film composer David Arnold, Graffiti on the Trainis equally a welcome return and essential listening, proving the band is still relevant and has yet to fully reach its creative zenith. 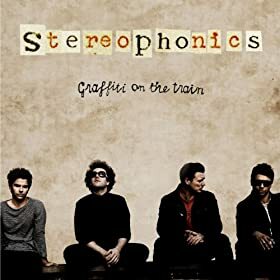 The album closes with the stripped down “No-one’s Perfect” (which could easily win the award for Jones’ best vocal performance), but Graffiti on the Train is the closest any Stereophonics album has come to perfect in nearly a decade.